Hi all!!! Not sure if you've noticed.. but it's only 9 days away from Chinese New Year (23rd Jan)! This year I'm gonna spend my Chinese New Year here in Perth! Chinese New Year is quite a big thing for me! Every year my mom will ask me to decorate the house (which ends up being decorated by my sis anyway :P), we get to have a delicious vegetarian breakfast on the first day of Chinese New Year, bring bags of goodies to visit relatives, collect Ang Paos (Red Packet), eat all their snacks, watch Chinese New Year TV shows, then go home and count how much I got from the Ang Paos (favourite moment) hahahahaha kidding. In our culture, we don't visit families empty handed. We will bring some CNY snacks, some mandarin oranges and more things when visiting someone. It's kind of a tradition. Sometimes can be quite a headache on what to get for others! Well.. this is the time that I comes into rescue!!! 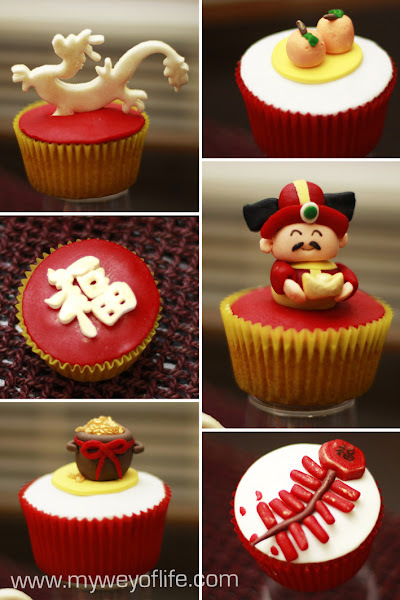 CUTE and DELICIOUS Chinese New Year Cupcakes!!! Instead of getting all kinds of things when you think they might already have it, why not get these cute and delicious cupcakes when you visit them?? 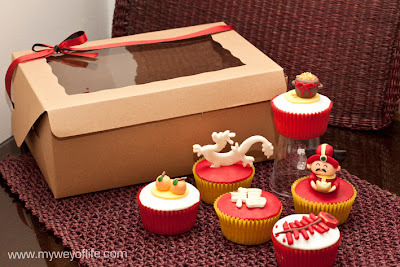 and to top it off, all CNY's toppers that were handmade by me! 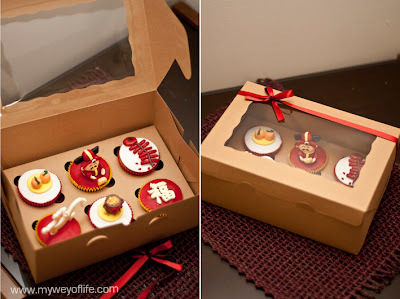 Totally edible! I have a Dragon (Dragon year! ), cutesy mandarins, the word 福 (Good fortune), Choy San Ye 财神爷 (God of Money) with a Gold nugget, a pot of GOLD and chinese style fire crackers!! A nice box to sit all the cute cupcakes too! It's a nice gift to give for people you love and care for! 6 orange flavoured cupcakes with 6 different toppers. 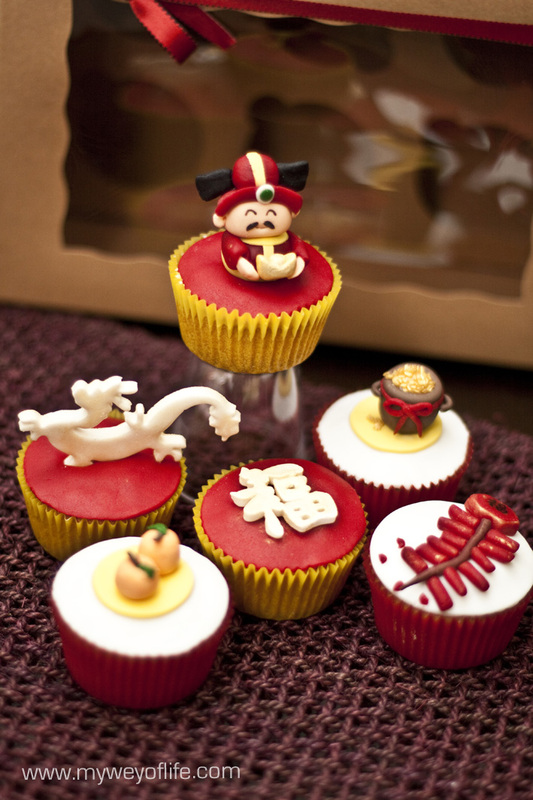 The reason why pick up date is so near to Chinese New Year is to keep the cupcake fresh and moist! :D Yummo! beautiful job! must have taken a while to make them that perfect!